Leonce Richard and Mark Osterhaven at Worth Avenue Yachts send word that they've closed on their listing for sale, the 26.21m sportfish yacht Migration. Migration was built in GRP by US yard Hatteras and delivered in 2004. Her sole owner kept her mostly on freshwater in the Great Lakes. Decorated in cherry wood throughout, she has a large saloon with a curved leather couch, wet bar, television and entertainment system plus a dinette for casual meals. An enclosed air conditioned flybridge comes with two helm chairs, comfortable seating and bar. Accommodation is for eight guests in four staterooms. The master suite is full beam and has a king size bed, two cedar lined wardrobes and a 42 inch television while the VIP stateroom has a queen sized bed. The starboard guest cabin has two twin beds convertible to a queen while the port cabin has a queen sized bed. All staterooms have television screens and full en suite bathroom facilities. 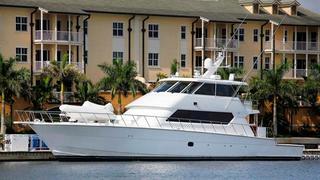 Powered by twin 1,800 Detroit Diesel engines, Migration was asking $2,995,000.